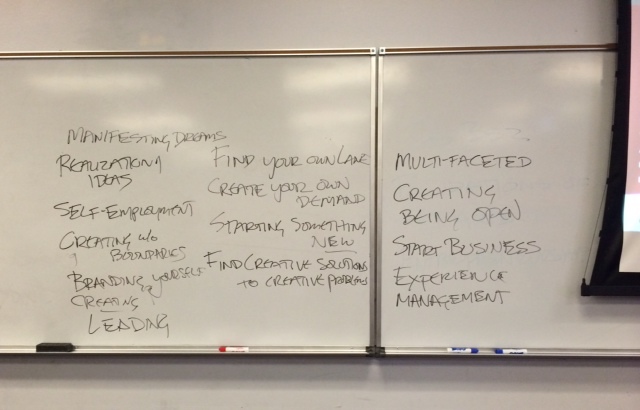 Last fall, in response to some blogosphere noise asserting that there was no such thing as arts entrepreneurship, I posted some of my students’ articulations of the construct as written on a course discussion board. This semester, students are reading Andrew Simonet’s downloadable eBook, Making Your Life as an Artist, and for this first assignment, Barry Hessenius’s interview of Aaron Dworkin, a selection from David Cutler’s The Savvy Musician, and a short blog post from Kimberly Bryant on practical thinking for arts entrepreneurs. We spent the first two class sections getting to know oneanother and discussing arts entrepreneurship as an ACTION, an action that positions the artist in relation to society. Here are just a few of their responses. Being an arts entrepreneur means that you have an eye for beauty, you are willing to take risks, have the passion to continue doing what it is you love despite any ‘starving artist’ cliché, and the confidence to do whatever it takes to make your craft into a sustainable career path. I think that it’s the artistic entrepreneurs who lead the forefront of contemporary art and culture because they are the ones who strive to do something different. However as the years go by and technology increases, the line between ‘art’ and ‘science’ begins to fade in some contexts and we start to see artistic innovations to serious problems. As arts entrepreneurs we have a much more direct relationship with our auidence than a traditional artist. The traditional artist is free to exspress themselves in isolation; whilst an arts entrepreneur can derivive ideas from self-exspression, self-exspression for its own sake is not their goal. Rather they must find ways to relate their own creative endeavors in such away that they can benifit both themselves and others. To me, an “arts entreprenuer” is someone who creates for them as much as they do for others. When met with failure, an arts entrepenuer learns from this and tweaks their approach, hopeful for success. An arts entrepenuer is bound to be met with adversity time and time again, it’s how he/she reacts to it that makes the likeliness of success a greater or lesser possibility in their future. Unlike an established business that sets the pace of the market an entrepreneur has to latch onto the pace of the market while trying to disrupt it. This takes action, an entrepreneur does not go into the market doing what has already been done or else they would not be an entrepreneur to begin with. Having a passion for what you are doing is the right type of entrepreneur and is neccessary to survive through the challenges that will occur. A passionless venture is not a legacy that an entrepreneur should leave behind. Being open to outside influence is also important for a start-up because they will need some help along the way, friends can be made and relieve the burden of taking on a project alone. Lastly, an arts entrepreneur should not go into the venture with the expectation of living a carefree life. Although the consumption of arts increases the quality of life for its consumers the production of arts and stimulation of a demand for arts is not a carefree way of life and is a culmination of hard work. Andrew Simonet’s correlation between the scientific method and the artistic process broke down an a person’s artistic endeavors well. Aaron Dworkin’s viewpoints on an entrepenuer’s positioning within the arts world made me realize just how important it is to have the right mindset in order to be not only a relevant company (or whatever your art may be) but also a profitable company. The subject of failure was brought up quite frequently in the week’s readings. The topic of failure was basically tackled the same way, in order for any type of success to be found, failure has to be met first. Failure is a necessity. I’ve noticed that for some reason, when seeing another’s success, it is generally pictured as something met with not much struggle. In reality, anything in history that has had success, is due to its prior failures.To me, an “arts entreprenuer” is someone who creates for them as much as they do for others. When met with failure, an arts entrepenuer learns from this and tweaks their approach, hopeful for success. An arts entrepenuer is bound to be met with adversity time and time again, it’s how he/she reacts to it that makes the likeliness of success a greater or lesser possibility in their future. This entry was posted in Arts education, Arts entrepreneurship, Higher education. Bookmark the permalink. Most of the responses to the question ‘what it means to be an art’s entrepreneur’ read like good little party line followers. All the tag line are there. Being entrepreneurial as an artist is to be sustainable, to be innovative in useable ways, to involve your audience, to adapt to failures, to engage people. Yet none of those goals seem to be defined. How do those goals come to be? Art schools today have endure some criticism that their programs create a certain academic approache to art making that are led by the dominate art ideas of the time. There is some truth to that but at least academia has remained somewhat dedicated to an art for art’s sake ideology. Carte Gillies is right. This entrepreneurial approach to art making is rife with problems. “How do those goals come to be?” In large part by making really excellent art! It sounds like your students are getting a great background of perspectives on arts entrepreneurship. I was happy to see a number of these responses mention that this outwardly directed art can also be made with attention to intrinsic values and self expression. As you and I have discussed before, just about anything can be made entrepreneurial, and the assertion that art was somehow immune to that simply didn’t make sense. So, while entrepreneurial art can and should be directed to an audience, my only fear is that we end up discrediting art that is not made from such outward motivations. I worry that we take the value of art as primarily if not entirely based on what it does for an audience. Yes art can make the world a better place, but it doesn’t always start by making the external world something better. The thing I would caution is that we don’t lose sight of the value that art has for the artist. The world can be made better one artist at a time. More artists in the world is a good thing. And making art can serve no other purpose than that artist’s own exploration of value. Sometimes, also, this art has the greatest impact on society when it is shared. And this suggests that the intention for entrepreneurial activity is not the only means for accomplishing a civic goal of art. If that is true, then not just entrepreneurial art needs to be encouraged, but ALL art. Which is not to say that only grand gestures make a difference. Humble art that reaches no further than the individual home it resides in and the life that activates its value can be honored too. Entrepreneurial success is not the only measure of impact…. So I’d like to say “Yes, entrepreneurship!” but also also “Yes, intrinsically motivated self expression!” These are two very different sides of the same coin, and if you really want to understand art you have to recognize why some folks stand on one side and some on the other. The idea that the ‘starving artist’ is a cliche is itself a cliche of the entrepreneurial mind, unfortunately. It is simply not the purpose of all art to be made for an audience. It is simply not the purpose of all art that it can or should be for sale. It is simply not the purpose of everyone making art that they would fit an entrepreneurial category. Every hobbyist and amateur knows this. Every kid playing with crayons embodies this. Can we not honor their own motivations at the same time as encouraging entrepreneurial attitudes in others? One of the problems I see in today’s art world is that there is too little respect for art done for intrinsic purposes, and that only seems to be cutting off a nose to spite the face. If we are asking ‘starving artists’ to find value in entrepreneurship, isn’t it right that entrepreneurs learn why other artists are not like them? Shouldn’t we also teach why its important for art to sometimes be made entirely for its own reasons? Not as a preliminary activity, or possible side effect of entrepreneurship, but as an end in itself? Teaching only the entrepreneurial value of art skews an appreciation of art in ways that are both untrue and unfortunate. If the world needs more art, it needs more entrepreneurs AND folks doing creative things for their own personal reasons. Lets not pretend otherwise. The disdain for ‘starving artists’ is unseemly. We should be advocates and chauvinists for the creative potential of ALL art, not just those who can make a living at it. Being an art professional is not the only thing we can value. Its not even the only way to make ‘good’ art…. Anyway, thanks as always for the good work you do! ‘Can’ is a wonderful word of possibility. I just worry that we too often and easily confuse ‘can’ with ‘should’. If we simply assume the values of only specific ends we wind up with prescriptions rather than potentials. We can’t discount that art sometimes can and does connect the artist’s needs with those of the community, but it doesn’t only do this nor should we expect it to. If you can eat spaghetti every night for dinner it doesn’t mean that you therefore should eat it every night for dinner. I’m just asking us to look at other values. Sure you can use art in this way. What else can you do with it? Art is not simply legitimate based on fitting between the needs of the artist and the community. “Bravo!” if it does, I suppose, but “hell yeah!” if it doesn’t too. I just worry that we take art as having failed if it only serves the artists’ needs but not in some way the community’s. That is a wrong conclusion to draw. If it was meant to serve the community and doesn’t, well I guess that is a measure of failure. But it is incorrect to assume that any and all art therefore aims in this direction. It doesn’t and it shouldn’t. Entrepreneurial art is a small corner (maybe a large corner) of human creativity. Why would we ever take it as the model for all art? Artists’ own disrespect for other forms and practices of art is but the seed for society to disrespect the forms and practices of art it doesn’t understand or sympathize with. And that is a dangerous path to tread….. We are laying the groundwork for chauvinism and discrimination when we promote only specific values as worthy. The worthwhile contributions of art are too varied to fit only in neat little categories like ‘entrepreneurial’ or ‘community based’, etc. We are artists. Surely we can imagine something bigger than our own biased take on things? What good is imagination if it plays out in only little prescribed boxes? If there is freedom to creativity, aren’t we also free not to be entrepreneurial, not to be even tempted to look beyond our own needs? Isn’t that the beauty of a word like ‘can’? If I’m not really free after all these years, I suppose someone had better let me know…. Let “Thou shalt entrepreneur” be thine eleventh commandment…. You can, perhaps, see why I am making this case. Let the entrepreneurs do their thing, but not at the expense of non-entrepreneurial art and artists. One is not the lesser form of the other. Or are we suggesting it is? My reply is hasty by necissity – not all artists are entpreneurial artists. All artists make work; some artists make work solely as creative expression; entrepreneurial artists make work that fufills the needs both of themselves as artists and of their audience. A in-a-nutshell reductive distinction, but useful. I don’t claim to speak for artists, only to speak to artists who want to take a more entrepreneurial approach to their creative work.